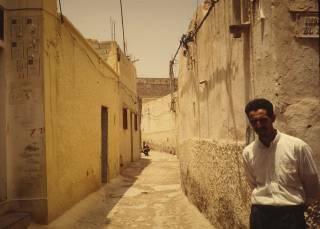 Much of my fieldwork was carried out in the large provincial town of Oujda, in the North-East of Morocco. It had the reputation, nationally, as a far-flung, somewhat backward part of the Kingdom, with as many associations with nearby Algeria as with the state to which it belonged. 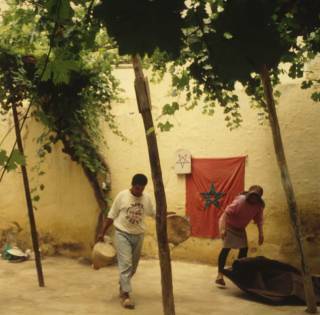 Many Oujdis (the inhabitants of the town) who I came to know considered local society as rather traditional and conservative in its ways and were frequently disdainful of the Western-influenced materialism and immorality held to exist in the bigger Moroccan cities of Casablanca and Tangiers. Despite many strong links with their Algerian neighbours, Oujda was, at least in its public manifestations, as patriotic about being Moroccan as anywhere else in the country. Since the recent political turmoil erupted across the border in Algeria, many Oujdis were coming to consider their community as something of a bastion against both materialism on the one hand and religious extremism; a stance reinforced by government rhetoric at the national level. In the course of my research I became involved in several distinct musical communities, including one group of women who met each week to play and sing religious music for an all female audience. 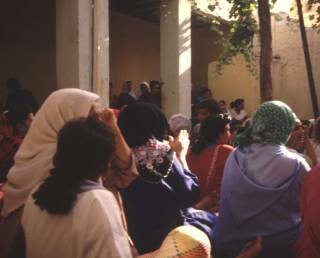 This group called themselves the Aissawa and were led by a woman in her early sixties who referred to herself as the Fqira (1). Every Friday afternoon, a time of the week when devout males worshipped at the mosque, around one hundred women from all over the town, but especially from the local, poorer quarters, met at a small, walled enclosure. This courtyard was open to the sky with one small doorway opening onto a lane near the centre of the ancient medina part of the city. As the audience arranged themselves and their smaller children on rugs, the Fqira and another six or seven other female musicians seated themselves at one end of the courtyard and began to sing chants and play bnader, (sing. bendir, a common North African frame drum) (2). These chants were repetitive and mostly comprised of call and response patterns, so that, through clapping and singing, the audience became intimately involved in the performance. The themes of these songs were largely concerned with praise of God and beseeching more local religious personalities for their intercedence in delivering practical help to the gathered women. What was asked of these spiritual intermediaries might be for general assistance or, as in this example, quite specific.